Italie Voyages, circa 1935. Cover to a travel magazine published by he Ente Nazionale Industrie Turistische (ENIT - Italian State Tourist Department). Unsigned. Italia, 1936. Cover to a travel magazine published by he Ente Nazionale Industrie Turistische (ENIT - Italian State Tourist Department). Travel in Italy, 1934. Cover to a travel magazine published by he Ente Nazionale Industrie Turistische (ENIT - Italian State Tourist Department). Signed "Retrosl," designed by Pizzi & Pizio - Milano-Roma. 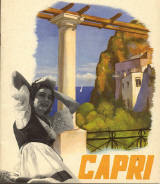 Travel brochure for Capri, 1937. Published by the Ente Nazionale Industrie Turistische (ENIT - Italian State Tourist Department). Designed by Pizzi & Pizio - Milano-Roma. Reiseland Italien, 1935. Cover to a travel magazine published by he Ente Nazionale Industrie Turistische (ENIT - Italian State Tourist Department). Designed by Pizzi & Pizio - Milano-Roma. Italia, 1936. Cover to a travel magazine published by he Ente Nazionale Industrie Turistische (ENIT - Italian State Tourist Department). Designed by Pizzi & Pizio - Milano-Roma. Lake Como, 1938. 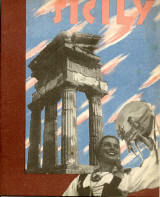 Cover to a travel brochure published by the Ente Nazionale Industrie Turistische (ENIT - Italian State Tourist Department). Signed "A. Mercatali," designed by Pizzi & Pizio - Milano-Roma. Travel brochure for Sicily, 1938. Published by the Ente Nazionale Industrie Turistische (ENIT - Italian State Tourist Department). Designed by Instituto Romano di Artii Grafiche di Tumminelli & Co., Roma.